Well, this picture keeps getting uglier. 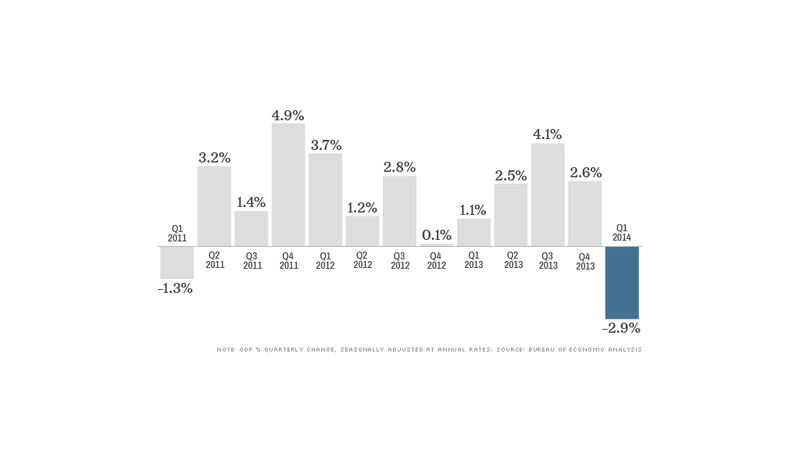 Gross domestic product -- the broadest measure of economic growth -- contracted at a 2.9% annual rate in January through March, according to the latest revision from the Bureau of Economic Analysis. 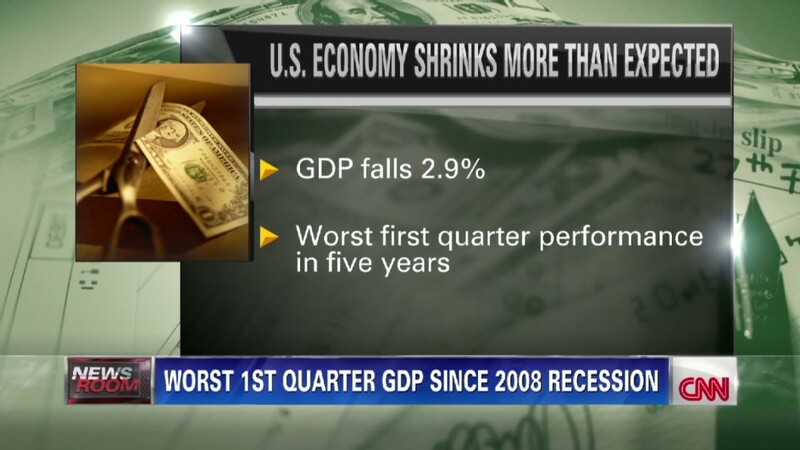 That's the weakest quarter for the U.S. economy since the Great Recession. Economists described the number as "horrid" and "dreadful," but then shrugged it off. So did investors. In fact, stocks rose. "Despite the awful start to the year, the U.S. economy is nowhere close to recession," said Sal Guatieri, senior economist for BMO Capital Markets. Here are three key reasons why economists aren't too worried about another crisis. 1) They blame the weather: Consumer spending is the single largest driver of the U.S. economy, but blizzards kept customers away from restaurants, shopping malls, car lots and open houses more than usual this winter. The icy winter also slowed shipments both domestically and abroad, and as a result, exports to foreign countries declined. Since those slowdowns were weather-related, economists are convinced they're only temporary. "The larger contraction in GDP in the first quarter is not a sign that the U.S. is suffering from a fundamental slowdown -- it was still largely due to the extreme weather," said Paul Dales, senior U.S. economist with Capital Economics. But there's one caveat here: There was a sharp decline in health care spending at the beginning of the year, which economists aren't able to fully explain yet. Enrollment in health insurance is up due to the Affordable Care Act, but it looks like Americans spent more on health care in the fourth quarter, and then pulled back on that spending at the beginning of 2014. There's a big question here: If more people have health insurance, why did spending on health care suddenly fall? There are no answers yet, and it may turn out to be a temporary blip, but it's something economists and policymakers will be watching. 2) It's not a final number: Some economists take this GDP number with a grain of salt because it will be revised again next month when the Bureau of Economic Analysis makes historical revisions, going back to 1999. The weak number also doesn't fit with the story told by other key economic indicators, like job growth. 3) The economy has improved since March: Hiring slowed in December, but it has since picked up again. In the last five months, the economy added 1.1 million jobs. Hiring at that level is consistent with an economy that is growing modestly around 2% to 3% a year -- not an economy that is contracting. "Disappointing data showing U.S. GDP suffered a steeper than previously thought downturn at the start of the year has been rapidly overtaken by more up-to-date survey data, which show the economy surging in June," said Chris Williamson, chief economist for Markit. The same old story remains: This recovery is underway, but it's choppy and still very slow.